Dental problems can happen over time for a wide variety of reasons, and virtually all of them can be successfully prevented with the help of quality oral hygiene and regular checkups at Atsalis Dental Excellence. By giving you the tools you need to protect and strengthen your smile, our team hopes to help you achieve amazing oral health for life! Contact us today to learn more about our preventive services here in Plymouth or if you’re ready to schedule your first appointment with Dr. Atsalis. 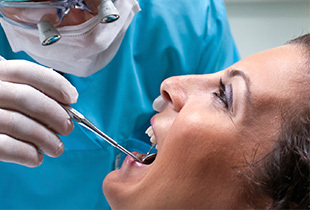 Attending regular checkups and cleanings are vital to maintaining a healthy, happy smile that lasts for a lifetime. Even patients who diligently brush and floss may end up falling victim to dental problems that aren’t noticeable to untrained eyes and our team can provide a helping hand in locating these issues early on. If you’re regularly experiencing chronic jaw pain or severe headaches, TMJ disorder may be the root of the problem. The temporomandibular joints (TMJ) are important parts of the body, connecting the lower jaw to the skull, and issues like bruxism (teeth grinding) and a misaligned bite can throw the system off-balance. Thankfully, our team can prescribe an occlusal splint that will help your jaw find a more comfortable resting position. Bruxism, also known as teeth grinding, is a very common dental problem that affects patients of all ages. What’s worse is that it’s most likely to happen as you sleep, which means that many people are completely unaware as to why their jaw hurts in the morning or their teeth seem more and more worn down. 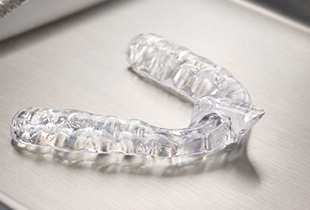 If Dr. Atsalis notices warning signs of bruxism during your checkup, he can provide a personalized nightguard to protect your smile. All a patient needs to do is wear the appliance as they sleep, and the teeth will be unable to meet in the same harmful way. When dental emergencies strike, it’s important to know that you can pick up the phone and call a dentist that you trust. At Atsalis Dental Excellence, we do our best to get urgent cases in as soon as possible, and our team can also provide first-aid assistance and guidance over the phone as well. When you arrive, Dr. Atsalis will stabilize your condition and relieve your discomfort before helping you take the next steps towards regaining your oral health. Don’t hesitate to contact us today! Our Plymouth practice’s doors are open to patients as young as 3 years old. 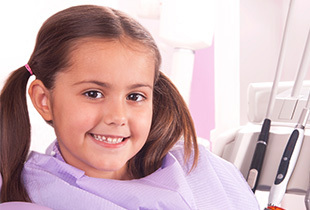 Dr. Atsalis loves working with children and helping instill the importance of dentistry in them from a young age through gentle checkups, refreshing cleanings, and other kid-friendly care that leaves them smiling. In fact, you’re always welcome to schedule appointments for the whole family!